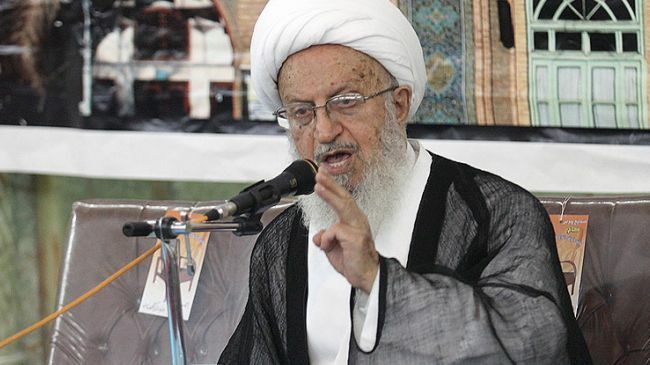 JNN 01 July 2014 Tehran : Senior Iranian cleric Ayatollah Makarem Shirazi on Tuesday harshly criticized Saudi Arabia over the continued crackdown on the Shia population. “We warn the Saudi officials that such extremist actions will hurt the sentiments of all Shias around the world,” the grand Ayatollah said in a statement released on Tuesday. Ayatollah Makarem further warned about the consequences of enforcing the death penalty for the Saudi Shia cleric, Sheikh Nimr al-Nimr. “Issuing the death sentence for a respected religious scholar will never be tolerated by the Shia clergy and their followers around the world,” the statement read. Al-Nimr has been charged with disturbing the Arab country’s security, giving anti-regime speeches, insulting King Abdullah in Friday Prayers sermons, and defending the political prisoners. “Instead of intensifying the crackdown on Shias, the Saudi rulers should heed their sorrows and grieves. They are calling for their lost rights. They are asking for the right to perform their religious duties. “They (Saudi Shias) love their country. And this is not logical to behave them in such a way,” the statement said. Last October, rights group Amnesty International censured Saudi authorities for not addressing the “dire human rights situation” in the kingdom. This entry was posted in Iran News, Middle East and tagged Ayat ullah Makaram Shirazi, Ayatollah Makarem Shirazi, grand ayatollah, Irani Shia Cleric, Saudi Arabia, Saudi government, Saudi officials, Saudi Shia, Saudi Shias, Sheikh Nimr. Bookmark the permalink.